This October during London’s Frieze Week, Christie’s will present the largest and most diverse selection of 12 works by Francis Bacon and Lucian Freud, two British masters of the 20th century. The group is led by Francis Bacon’s Figure in Movement (1972, estimate on request), held for 41 years in the prestigious collection of Magnus Konow. The work is a poignant meditation on human existence, expressed through the memory of Bacon’s muse and lover George Dyer, whose tragic suicide took place less than thirty-six hours before the opening of Bacon’s career-defining retrospective at the Grand Palais, and had a devastating impact upon the artist. Within Bacon’s oeuvre, Figure in Movement sits at the centre of the black triptychs. In addition, a collection of some of the earliest works on record by Bacon, comprises six pieces including his earliest surviving large-scale work, Painted Screen (circa 1930), a precursor to his famed triptychs. On loan to Tate, London, since 2009, the collection bears an outstanding provenance that includes Bacon’s first patron Eric Allden and his early artistic mentor Roy de Maistre. In the 1940s, five of the works entered the family collection of Francis Elek, who met Allden around this time; he acquired the sixth following de Maistre’s death in 1968. 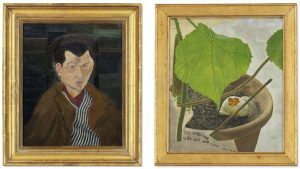 Similarly, Lucian Freud’s early Man in a Striped Shirt (1942, estimate: £1,000,000-1,500,000), created when the artist was 19, also from the collection of Magnus Konow, is presented alongside a still-life celebrating the artist’s love for his wife Caroline Blackwood, and a 1980 portrait of his friend and lover Susanna Chancellor. Two of the first studies of Francis Bacon Freud created in 1951 are also included. Selected works from this group will be on view at Christie’s Hong Kong (4-7 September), Los Angeles (5-8 September), New York (15-18 September) and King Street from 28 September, ahead of the auction on 4 October 2018. In 1939, Francis Elek came to England from Czechoslovakia as part of a swimming team, and became separated from his family at the outbreak of conflict in Europe. It was whilst searching for them through the Red Cross after the war that he met Allden, and subsequently acquired the majority of the present collection in the late 1940s. The collection represents some of the very first works in Bacon’s catalogue raisonné, capturing the birth of one of the twentieth century’s greatest artistic voices. Collectively, they chronicle Bacon’s formative influences, blending his early interests in furniture design with the contemporary innovations of the European avant-garde. while an early work on paper, Gouache (1929, estimate: £180,000-220,000), is testament to Bacon’s early fascination with interior architecture and design. Francis Bacon’s rugs shine a vital light on the relationship between art and design in his early practice, the present three belong to a group of just 12 surviving examples (All: Rug, circa 1929, estimate £70,000-100,000). Frequently hung on the wall like paintings, inspired perhaps by the tapestries of Jean Lurçat, their bold geometric designs owe much to Bacon’s interests in Synthetic Cubism and the Bauhaus movement, encountered during his time in Berlin and Paris between 1927 and 1928. Unseen in public until 2011, Francis Bacon by Lucian Freud (both 1951, estimates: £500,000-700,000) belong to an outstanding group of three studies that represent Freud’s first depictions of Bacon, the third was in the collection of R. B. Kitaj and sold by Christie’s in the estate sale of 2008 for £468,500, against an estimate of £100,000-150,000. The studies are among the most intimate records of one of the 20th century’s greatest artistic relationships. They depict Bacon in a spontaneous moment of characteristic irreverence: shirt and trousers unbuttoned, eyes downcast, hips flexed and chest bared. Freud found great inspiration in Bacon’s impulsive painterly language while Bacon appreciated his companion’s witty vitality. Painted when Lucian Freud was just 19 years old, Man in a Striped Shirt (1939, estimate: £1,000,000-1,500,000) is a rare early work that bears witness to the young artist’s talent. Richard Chopping was a fellow student of the East Anglian School of Art in Dedham, and also a friend of Francis Bacon, appearing in the 1978 diptych Two Studies for Portrait of Richard Chopping. Freud’s painting is charged with his uncompromising eye for the specific, studying Chopping’s distinctive features with the intense focus typical of Freud’s earliest paintings. Executed in the early 1950s, Still Life with Zimmerlinde (circa 1950, estimate: £400,000-600,000) is an intimate study of a zimmerlinde, more commonly known in English as a house lime, dedicated to his second wife, Caroline Blackwood. One heart-shaped leaf dominates the composition, its serrated outline faithfully traced and its bright, backlit green surface exposing every vein. To the lower left, the image is cut short by a swathe of still-raw canvas in which Freud has written, in his distinctive rounded hand, ‘For Caroline / with all my love / Lucian’. Gifted by Lucian Freud to the current owner, Head of a Woman (circa 1980, estimate: £350,000-450,000) stands among the artist’s earliest depictions of Susanna Chancellor. Freud first met her when she was just seventeen years old and the two quickly fell into a passionate relationship that would continue in various guises until the artist’s death in 2011. However, it was not until nearly 20 years into their friendship that Freud would begin to depict Susanna, coinciding with a renewed focus on his familial circle. Executed in 1972, Figure in Movement takes its place among an extraordinary group of works painted in the aftermath of George Dyer’s tragic death the previous year. In the hustle between figuration and abstraction, Bacon creates a vivid sense of the transition from life to death, transforming Dyer’s distinctive features into commentary on the fleeting nature of life. Figure in Movement sheds critical light on Bacon’s understanding of the human condition during this period. Laced with allusions to photography, literature, reportage and film, it is an attempt to visualise the ways in which figural traces continue to live in the mind: Dyer is simultaneously reincarnated and estranged, his likeness skewed to the point of ambiguity and mirrored imperfectly in billowing black. Included in Bacon’s 1983 touring retrospective in Japan, as well as his 2016 exhibition at the Grimaldi Forum in Monaco, Figure in Movement demonstrates the new artistic directions he pursued during the 1970s, with the period following Dyer’s death seeing a move away from the characterful portraits of Bacon’s 1960s Soho circle towards dark, existential meditations on mortality.